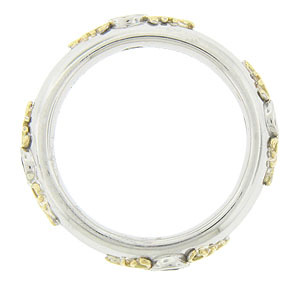 This elegant contemporary wedding band is fashioned of sterling silver, adorned with 18K yellow gold leaves. 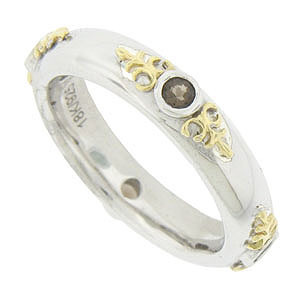 Four smokey topaz quartz are set into the surface of the ring. Each faceted stone is framed by a pair of feathery gold leaves. The brightly polished wedding ring measures 3.87 mm in width. Size 7. We cannot re-size, but we can reorder in other sizes.